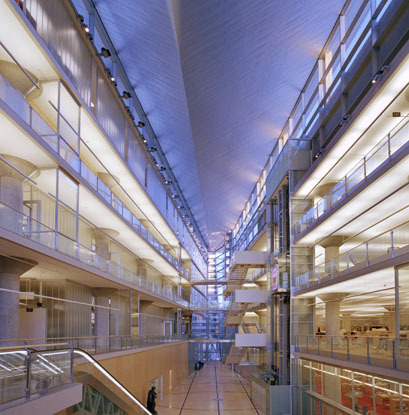 Libraries are usually quiet places, but while the Minneapolis Central Library might be silent inside, Cesar Pelli's striking design is no shrinking violet. The arresting steel-and-glass structure, located in a busy downtown district, brandishes a 90-ton beam that runs through the building and juts out into the cityscape. 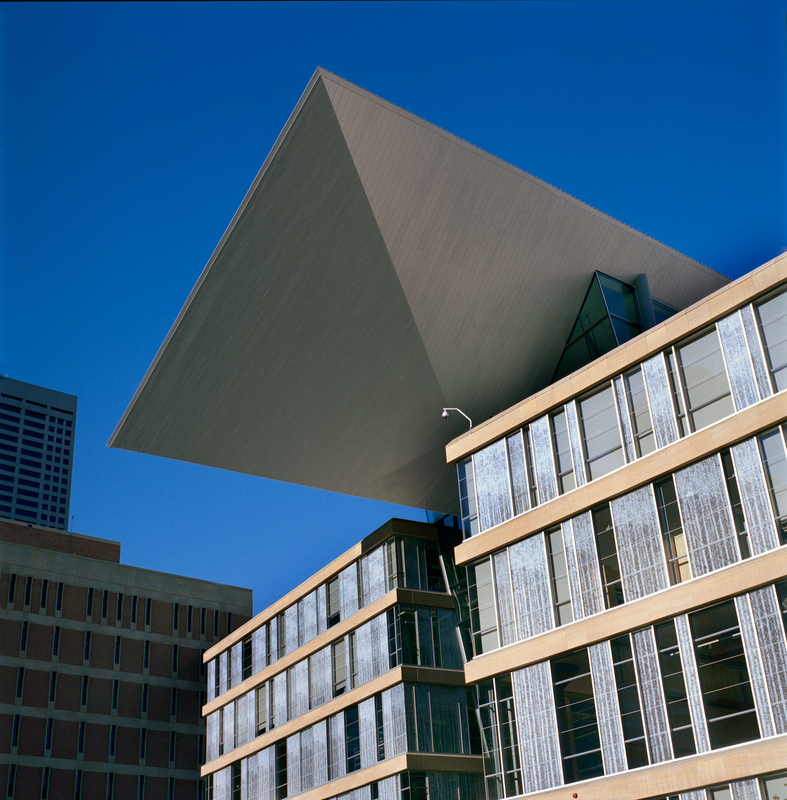 According to Pelli, "The wing gives the building character, makes it civic. It immediately tells you the library is here when you come up Nicollet or Hennepin." 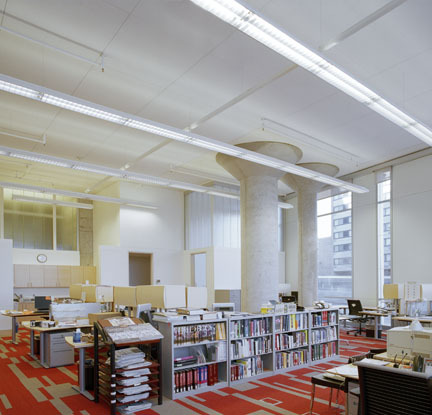 Working with local Hunter Douglas partner Jim Tegan of Tegan Marketing, the architects specified interior and exterior Hunter Douglas' Luxalon® metal ceilings to cover the wing. 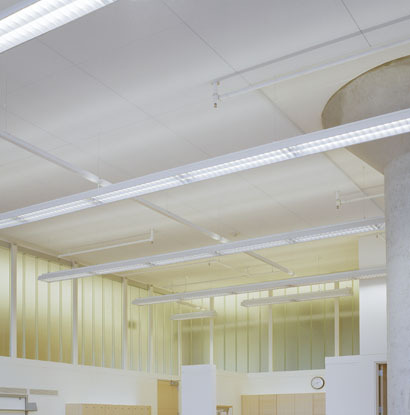 Their smooth, uniform surface reflects light and helps create a luminous glow, and perforated planks enhance acoustical absorption for the interiors. 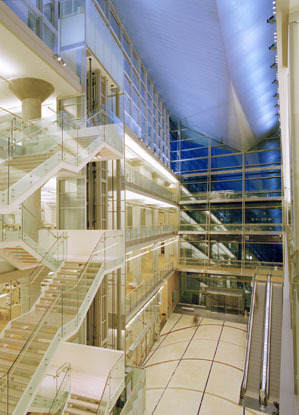 A cathedral-like, five-story atrium complements the building's grand architectural gestures, but also welcomes in ample natural light. Sky bridges criss-cross the space, giving visitors easy access among areas and providing panoramic views. "I wanted it to feel welcoming, warm, luminous," says the architect, adding that every visitor should think: "This is my library" when they enter the space. To complete that feeling, Pelli incorporated ample amenities, including a convenient underground garage, cozy fireplaces in the reading areas, an art gallery, an auditorium, 300 public computers, a café, a bookstore, a cultural center, and 25 meeting rooms. In the meeting rooms, Pelli specified Techstyle® acoustical ceilings by Hunter Douglas to help ensure quiet for those inside (and out). 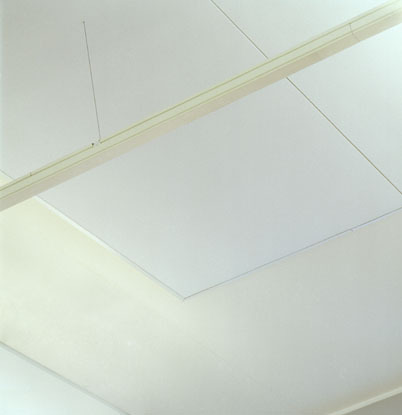 Their VOC-free construction also preserves indoor air quality.